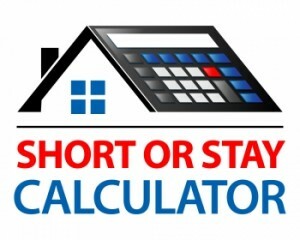 Being able to see the current market value of your home and projecting when your investment will break-even and become an asset again is invaluable to your decision making process.Â With the Short or Stay Calculator youâ€™ll be able to do so in a matter of minutes. Step 1: Your Property Information â€“ enter your propertyâ€™s address information. Step 2: Your Mortgage â€“ provide some basic mortgage information such as your balance and interest rate.Â NOTE:Â Your information is closely guarded and never sold. Step 3: Your Information â€“ supply your email address to receive an email that has yourÂ Short or Stay Calculator results. That’s it.Â It’s that simple!